A newly published study on Home-Range Size and Habitat Selection by Male Island Foxes (Urocyon littoralis) in a Low-Density Population by Elizabeth M. Drake, et al. reveals the largest documented territory ranges for male island foxes and new information regarding use of habitat at specific times of day. Prior to the catastrophic decline of island foxes on Santa Rosa (1996-2000), the population numbered over 1,700 individuals with a density of ~4 adult foxes per square km. Recovery on Santa Rosa was a slower process than on the other islands and this provided an opportunity to study territory size as the population recovered. The new study was carried out on Santa Rosa Island from 2009-2010, when the population was under 400 individuals and the density of adult foxes was less than 1 per square km. Drake found that in this period of low-density, male Santa Rosa Island foxes averaged territories of 3.39 square km in size. This is considerably larger than the less than .5 square km territories documented both on San Clemente (Sanchez, 2012) and on Santa Cruz prior to the population decline (Roemer et al., 2001). It is also much larger than the ~1 square km territories found on Santa Catalina when the population was well into recovery (King et al., 2014). While it is not surprising that island foxes expand territory size when there is less population density, the need for resources does not appear to be the driving force. During this period of fewer foxes, resources were plentiful. Therefore less territory was actually needed to provide adequate food for an individual island fox. Drake found little overlap of territory between the individual males. In most cases, only minor overlap occurred at territorial borders, suggesting vigorous protection of territory. Since Drake's data collection the population on Santa Rosa has more than doubled. As the density increases will the lack of territory overlap remain constant and will territory size decrease? Additional study is needed to answer these and other questions. 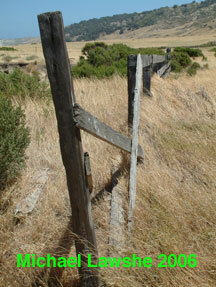 The study also looked at use of specific habitat. Surprisingly, there did not seem to be habitat types that were more desirable. But they did find significant data on use of habitat type at different times. The researchers found island foxes avoided bare landscape and grasslands during the day, but spent a significant amount of time in these areas at night. This use of specific terrain at night may suggest nocturnal hunting for deer mice and insects. Daylight hours were more typically spent in scrub and woodland areas. King, J. L., C. L. Duncan, and D. K. Garcelon. 2014. 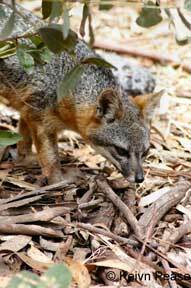 Status of the Santa Catalina Island fox 13 years after its decline. Western North American Naturalist. 7:382–396. Roemer, G. W., D. A. Smith, D. K. Garcelon, R. K. Wayne. 2001. The behavioural ecology of the island fox (Urocyon littoralis). Journal of Zoology London 255:1–14. Sanchez, J. N. 2012. Spatial ecology of disease spread in the island fox. M.S. thesis, Humboldt State University, Arcata, California.